You know autumn is right around the corner when apples start flooding markets and roadsides. While apples aren’t my all time favorite fruit, in part because I’ve always associated them with strict diet and hungry nights, I love using them in baking and salads. Apples are not only a good source of vitamin C and antioxidants, they are also a very versatile fruit that can be transformed into jams, curds, sauces, preserves, chutneys, apple butter and more depending on your creativity and the varieties. As I enjoy snacking with a Gala apples or a Golden Delicious, my favorite varieties of apples to bake with are Rome Beauty, Pink Lady and Granny Smith. For this season of apples I started with apples and rosemary muffins for Sunday breakfast. 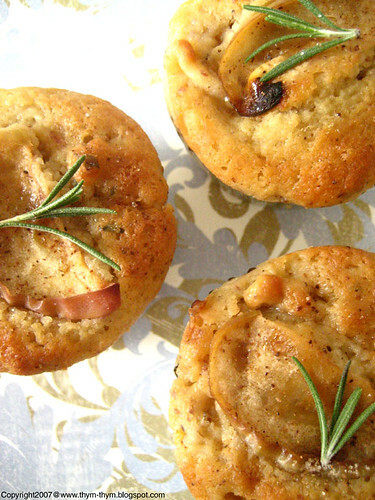 Adding rosemary to the recipe was my personnal touch to a simple apples and nuts muffins. 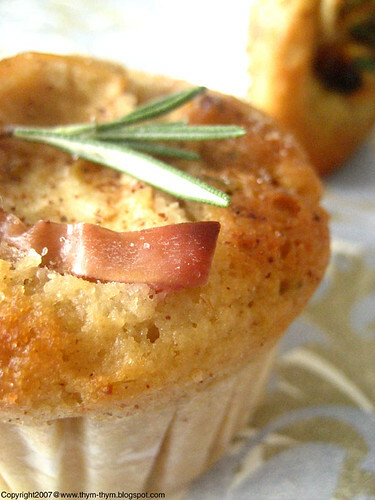 The combination of apples and rosemary might seem odd at first, but you will discover that the rosemary being slightly bitter and fragrant actually gives a nice smokiness and warmth to those moist muffins, different from the usual bland fruity muffin. I used Golden Delicious for this recipe but you can use any kind of apples appropriate for baking, making you kitchen smells like an orchard, smells like autumn, smells like home sweet home. In a large bowl, stir together the flours, bran, baking powder, baking soda, slat, cinnamon, and brown sugar. Set aside. Beat the eggs on low speed until blended, and then beat in the yogurt and butter. Add the dry ingredients and mix on low speed just until half moistened. Add the apple, raisins, and rosemary and stir just until evenly distributed. Do not over mix. Spoon the batter into buttered muffins cups. 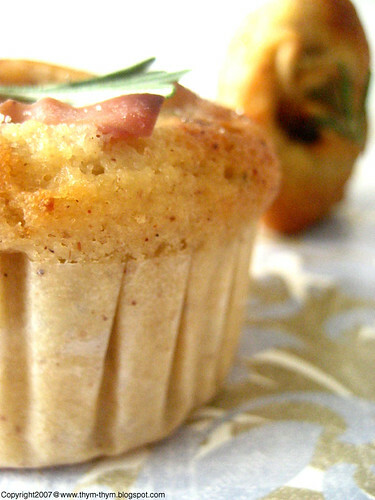 Put a thin slice of apple on each muffin and sprinkle the cinnamon sugar evenly over the top. Bake in a preheated 400F oven for 15-18 minutes. Let the muffins cool in the pan on a wire rack for 2 minutes, and then turn out onto the rack. Store in an airtight container at room temperature for up to 2 days or freeze for up to a month. Dans une grande jatte, mettre la farine, avoines, levure, bicarbonate, sel, cannelle et sucre brun. Mettre de coté. Battre les oeufs legerement, puis ajouter le yaourt et le beurre et battre. Ajouter ensuite les ingredients secs et mélanger juste pour que tout soit bien incorporé. Ajouter les pommes, les raisins et le romarin et mélanger. Ne pas trop mélanger. Verser la pate a muffins dans un moule a muffins beurré. Mettre une fine tranche de la pomme sur chaque muffin et saupoudrer de sucre/cannelle le dessus de chaque muffin. Faites cuire dans un four préchauffé a 200C pendant 15-18 minutes. Laisser refroidir 2 min dans le moule puis demouler les muffins sur une grille de patisserie. Ces muffins se gardent dans une boite hermétique a temperature ambiante pendant 2 jours ou peut se congeler jusqu’a 1 mois. J'ai déjà goûté au romarin dans les yaourts. J'imagine le goût avec les pommes...miam! The muffins must be super moist with the apples in the batter. I already love them. Rose these look so good I am impressed with the ingredients and will have to try them this weekend. I'll have to try these for Noah and I. Thanks for a recipe that's not all white flour and that has some healthy bran in it! Most muffins I won't let my 2 yr-old have because they are just like cake! - Samania, ton yaourt au romarin a l'air delicieux. Grace a tes recettes de yaourt, je n'en achete plus depuis des mois. Un grand Merci. - Mandy, you should try it. With only 1 tsp of it, The rosemary is not that overpowering. - Anh, they are indeed very mist and fragrant too. Thank you my dear for your kindness. - Marion, I am glad you like them. You are so welcome. - Shayne, I hope you will like them my friend. Let me know if ou do try them. - Gloria, thank you very much. Apples are so good:good for snack and for baking. I am sure you must have some great recipes. - Aimee, a healthy "muffin" if we can call a muffin healthy is always kid friendly. Noah must be a very lucky boy. - Gattina, I am sorry my dear. I've actually never heard of it before. What happened if you eat one? Your muffins are gorgeous! I love baking with apples, as well. Such a lovely flavor combination here! What a great dish to wake up to. Beautiful photos too! Hi Rose, I come to visit you through Wendy's site. Apples seem to be the top fruit right now and rightly so, as it is autumn! I love all of the varieties and the flavors they can impart - sweet and tart! Beautiful photos! - Deborah, you are just too sweet. We share the same love for apples then. - Amanda, it is the perfect breakfast treat indeed. Thanks for your kinds words. - Deb, welcome to you. I am glad you enjoy the pictures. I love apples too. They are the autumn fruit par excellence. Please,do come again. There is nothing that says Fall more than the aroma of apples baking in the kitchen. I've never tried apples with rosemary -- sounds intriguing. The muffins look delicious. I just happened upon your blog and have decided to make it a regular read. The Apple & Rosemary combination intrigues me! Nice site! - Hi Nora, Thank you very much my friend. It's funny that we share the same love for gala and golden delicious. - Lydia, I agree with you, it does sound intriguing but believe me it tastes great and not overwhelming. - Wendy, thank you very much. Let me know how it goes if you do try them. And thanks for "the 2 large eggs". - Gretchen, welcome. I am glad you enjoy my blog and my intriguing muffins. I hope you will continue enjoying it as much as I enjoy sharing my culinary adventures. Have a nice week. Massively successful! I'm blogging about my (slight) adaptation this evening. Thank you! Claude, je te le confirme ce fut un succes chez moi. Merci encore pour ton gentil message. Wendy, I am so glad. I can't wait to see what you've done with it. Can't wait! Can't wait! Hmmm..apples and rosemary, I gotta try this.